Traditional Chrome Plating has been used to beautify automobiles since the 1920’s. 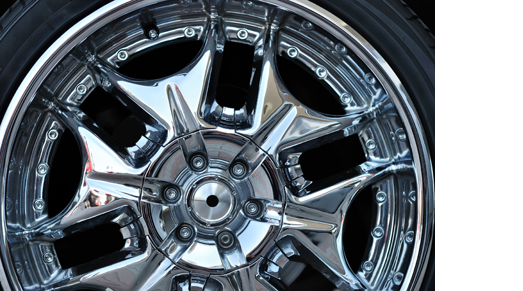 Chroming aluminum alloy wheels consists of first plating it in copper followed by a coating of nickel and finally a layer of chrome. This process involves the use of harsh and toxic chemicals, thus special EPA and hazardous chemical permits are required to operate a chroming operation. In addition, damaged chrome cannot be repaired. The only option to restore chrome wheels is to strip all of the plating layers back down to the bare aluminum and start over. The number of shops offering Traditional Chroming is in decline. We are fortunate to have a close working relationship with some of the highest quality chrome shops anywhere. We can restore your chrome wheels to like new condition. We can also have your standard finished wheels chrome plated. Many times we are able to offer a “chrome exchange” whereby we order in a set of chrome plated wheels that match your existing standard finished rims. When they come in, we schedule an appointment for us to switch your tires and tire pressure monitoring sensors to the new wheels. We then send your standard finished wheels back to be chrome plated and placed on the shelf awaiting the next customer. Traditional Chrome Plating is slowly being replaced by PVD Chrome.